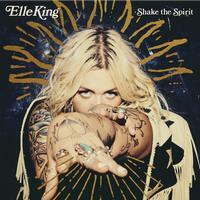 Album followup to her breakthrough debut featuring "Ex's & Oh's"
The lead single from Elle King's second studio album Shake the Spirit, "Shame" scores her first No. 1 on Billboard's Adult Alternative Songs airplay chart. Her debut album Love Stuff featured the breakthrough single "Ex's & Oh's," which earned her two Grammy nominations and was certified double platinum. Shake the Spirit features a couple of collaborations with Grammy winning songwriter and producer Greg Kurstin (Adele, P!nk, Sia) and also Ben Gibbard from Death Cab for Cutie. With "Shame," King now has earned chart-toppers in four distinct radio formats, as "Ex's & Oh's," ruled the Alternative Songs and Adult Pop Songs charts in 2015, while Dierks Bentley's "Different for Girls," on which she's featured, topped Country Airplay in 2016. With her new No. 1, King becomes the only act to have led all four lists.